2 tablespoons margarine ( or oil ). 2 tablespoon plain flour . 1 tablespoon parsley, finely chopped. Fry onion and garlic over margarine ( oil ). 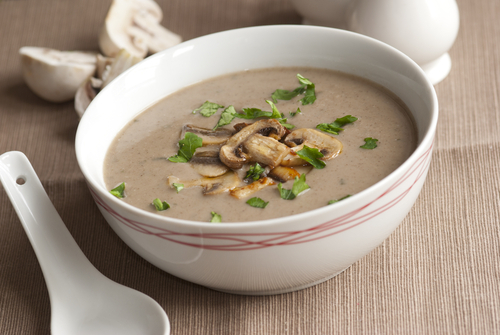 Add mushroom and stir for a few minutes. Add flour to it over medium heat with stirring. 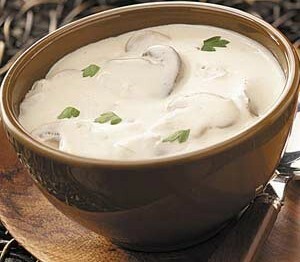 Dissolve milk in a cup of hot water and add it to with the remained water to mushroom mixture with stirring until boil. Reduce the heat, season with salt and pepper and simmer for 30 minutes. Adorn with parsley and serve hot with roasted bread.